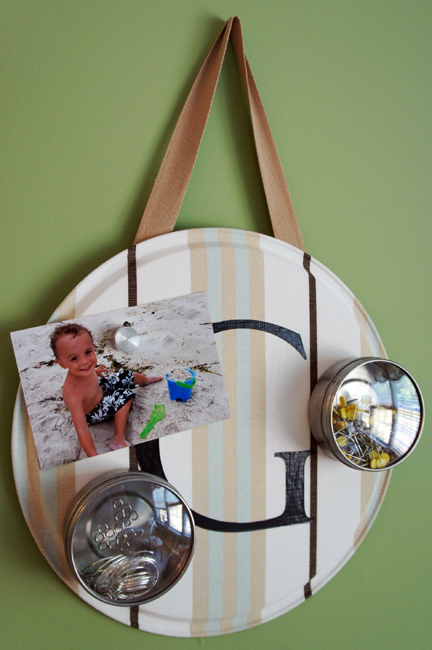 Our Modish project this month was a magnetic memo board. I love this project - especially for the kitchen because my refrigerator is stainless steel so I always need a way to display the kiddos' artwork, my endless supply of lists, and various other lovelies. This one is going into the office space that I share with my husband. It couldn't be too girly or I'd never hear the end of it! All you need for this project is a large scrap of fabric, a pizza pan (or cookie sheet), Mod Podge, scissors, and a ribbon. I also added an initial that I cut with my Silhouette from a sheet of Duck Tape. Did you know you can buy sheets of Duck Tape?? Imagine the possibilities! Coat the back of your pan with a generous coat of Mod Podge. I used a child's foam brush to apply. Lay your fabric over the Mod Podge and smooth into place. Add more Mod Podge around the edges and into the creases and press your fabric into place - working around the edge a little at a time. I recommend working slowly so that your fabric stays in place as the glue dries. If you work too quickly, you run the risk of pulling the fabric loose. Once your fabric is in place and the bond has started to set, trim around the edges. Try to maintain an even selvedge of about 1", but don't worry about perfection. This will be hidden on the backside of the pan. Clip into your allowance about 3/4" all of the way around the pan. This will help you secure the edges into place and keep a smooth fit with little bulk. Flip your pan over and use more Mod Podge to secure the tabs in place, keeping a tight fit around the edge as you go around the pan. Glue a ribbon to serve as your hanger. I used the twill tape I had left over from the boys' tee-pee. I'm finishing up a fun, super simple project to share with you tomorrow. Pinterest-inspired, of course. Want a sneak peek? Any guesses?